Sedgwick, Maine, the first town in the US to legalize any kind of food transaction as free and legal in order to keep the right to produce raw milk, organic produce, free-range eggs, and more, is revolutionizing the way America keeps its food rights – including saying no to GMOs. 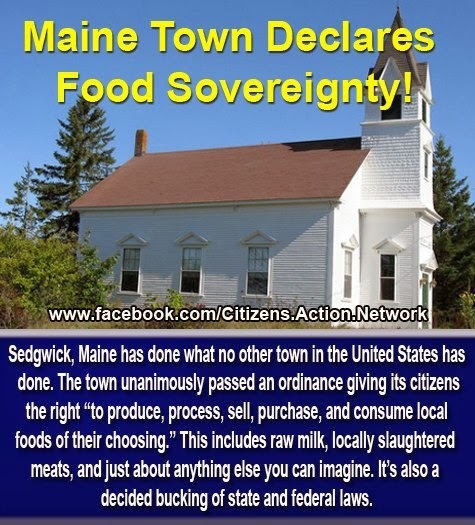 In other words, it is the first town to declare food sovereignty while opposing both state and federal laws. The town has passed an ordinance that protects citizens’ rights to “produce, sell, purchase, and consume any food of their choosing.” The ordinance laughs in the face of FDA regulations and their hodge-podge way of giving food a rubber stamp of approval, especially GMO. Three additional towns in Maine are expected to pass similar ordinances as well. The move is somewhat similar to a move one England town made, where the citizens transformed their entire town’s landscape into a giant food-producing garden. Both are great examples of moving toward food sovereignty. It isn’t just a declaration on the whim of a few city council members. There is a warrant added: “It shall be unlawful for any law or regulation adopted by the state or federal government to interfere with the rights recognized by this Ordinance.” This means that federal interference is prohibited in our food supply – at least in Maine. If you can’t get Monsanto out of the government, take the government out of your food. It’s a brilliant way around the convoluted system now in place that almost gave Monsanto the right to be exempt from federal prosecution for its poison food and which tries to hoist it upon the whole Nation without consent. A simple seller and buyer agreement is entered into where federal regulations can be bypassed by the seller agreeing to consume food grown by their neighbors organically in their garden or by the farm up the street with their own hormone-free dairy cows that customers have known for decades. It takes the feds and their dirty Monsanto money right out of the game. It is commercially grown food that is killing us all, after all - not locally grown food. In Maine, citizens can take advantage of local bounty, seasonal organic crops, and the good-old-fashioned way we used to produce food without Big Ag and commercial interference. Rural America is putting the big city budget of Monsanto to shame with this innovative way of taking down the monopolizing food giant. It’s about time ‘radicals’ in every small town across this nation did the same.